When Gyre Price lied her way into this expedition, she thought she'd be mapping mineral deposits, and that her biggest problems would be cave collapses and gear malfunctions. She also thought that the fat paycheck—enough to get her off-planet and on the trail of her mother—meant she'd get a skilled surface team, monitoring her suit and environment, keeping her safe. Keeping her sane. Em sees nothing wrong with controlling Gyre's body with drugs or withholding critical information to "ensure the smooth operation" of her expedition. Em knows all about Gyre's falsified credentials, and has no qualms using them as a leash—and a lash. And Em has secrets, too . . .
As Gyre descends, little inconsistencies—missing supplies, unexpected changes in the route, and, worst of all, shifts in Em's motivations—drive her out of her depths. Lost and disoriented, Gyre finds her sense of control giving way to paranoia and anger. 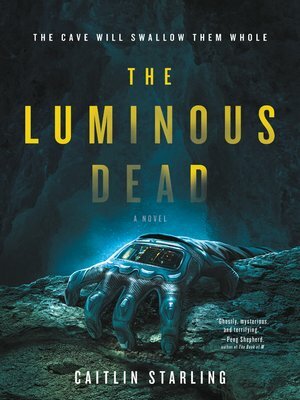 On her own in this mysterious, deadly place, surrounded by darkness and the unknown, Gyre must overcome more than just the dangerous terrain and the Tunneler which calls underground its home if she wants to make it out alive—she must confront the ghosts in her own head.